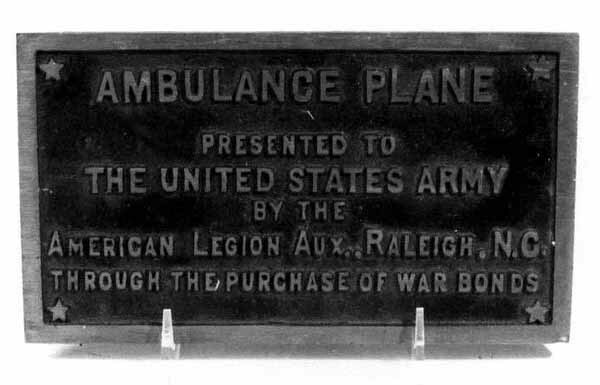 The American Legion Auxiliary in Raleigh had this presentation plaque made for an ambulance plane it gave to the United States Army through the sales of $129,000 worth of war bonds. 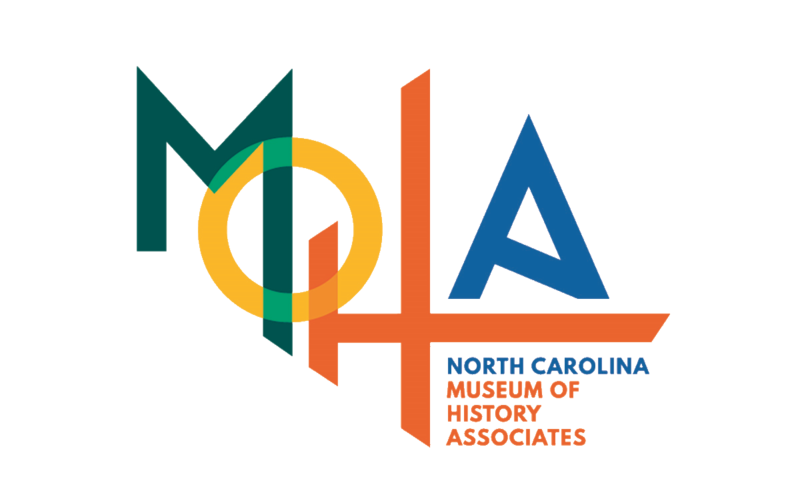 The group later decided not to mount the heavy tablet on the plane and instead gave it to the Hall of History (now the North Carolina Museum of History). 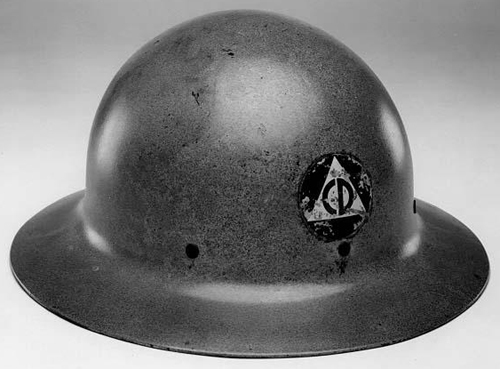 The Office of Civil Defense issued its members metal helmets to be worn both as head protection in the event of an enemy attack and as identification. Civil Defense workers were organized in every town and community and performed a variety of jobs to protect and care for civilians. After World War II, the French people sent thank-you gifts to America citizens for their donations of food to the war-torn country. They placed these gifts in rail boxcars and delivered them to every state via the French Gratitude Train. 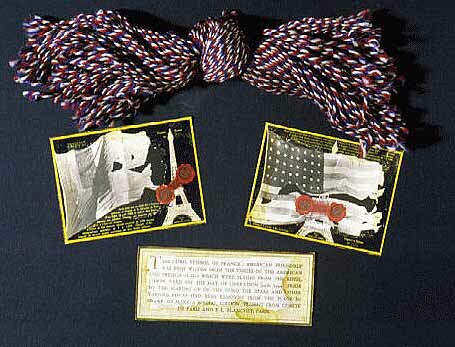 Among the items in the North Carolina boxcar was this cord made from remnants of the French and American flags flying from the Eiffel Tower when Paris was liberated. 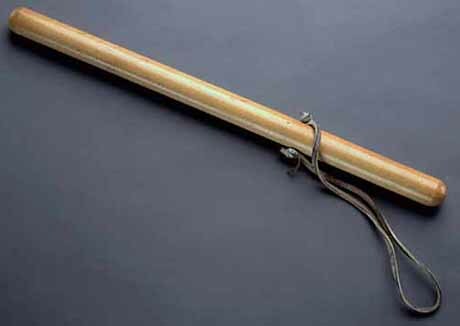 This nightstick was made for the Elizabeth City Council of Civil Defense in Pasquotank County following a period of racial strife during World War II. Law enforcement feared riots during evening blackouts. 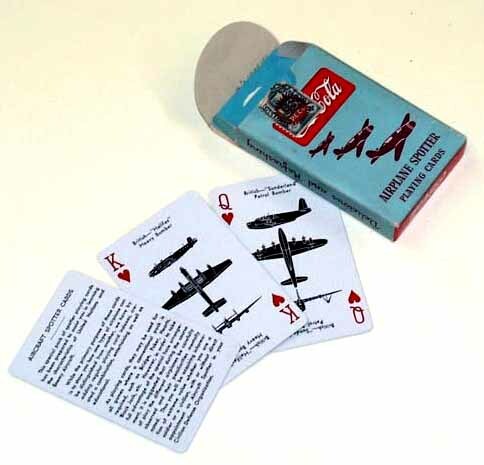 Aircraft spotter, or identification, playing cards taught civilians and Civilian Defense workers on the home front how to recognize the silhouettes of both enemy and friendly planes. These cards often carried the advertising logos of American companies such as Coca-Cola. American servicemen stationed overseas were commonly issued foreign phrase books so that they could communicate with local citizens. 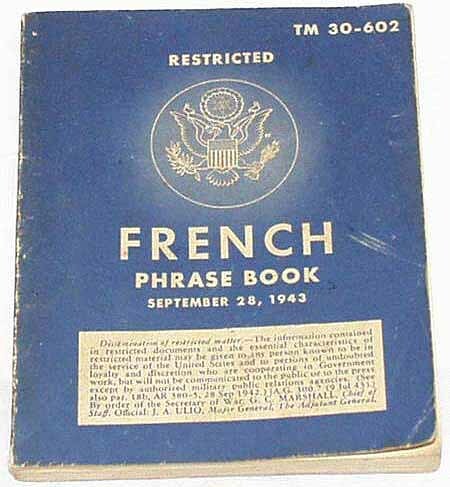 Salisbury native Robert N. Garrison used this French phrase book in 1944–1945 while serving in the United States Navy in France. 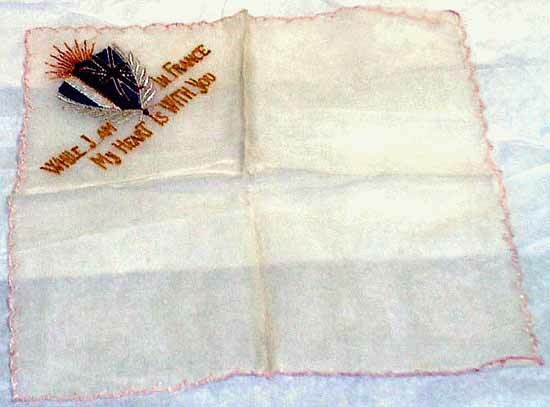 As a young sailor in France, Robert N. Garrison of Salisbury purchased for his wife this white handkerchief embroidered with the words “WHILE I AM IN FRANCE/MY HEART IS WITH YOU.” After the war Garrison returned home and operated a jewelry store. 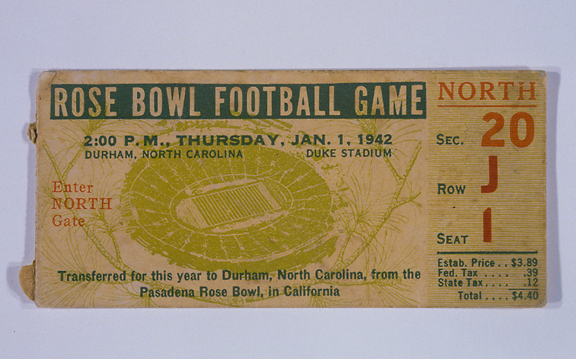 The only Rose Bowl game held outside California was played in Durham on January 1, 1942. The announcement of Duke University’s invitation to meet Oregon State University in the Rose Bowl in Pasadena, despite being made just after the bombing of Pearl Harbor, prompted tremendous celebrations across Duke’s campus. After the game was canceled because of growing fears that the West Coast would become the target of enemy bombing, Duke offered to host the game and Oregon State accepted. Anticipating a huge crowd, Duke borrowed bleachers from North Carolina State University and the University of North Carolina to increase the stadium’s seating capacity from 35,000 to 55,000. The Duke Blue Devils, after an undefeated season, lost to the Oregon State Beavers, 20 to 16. 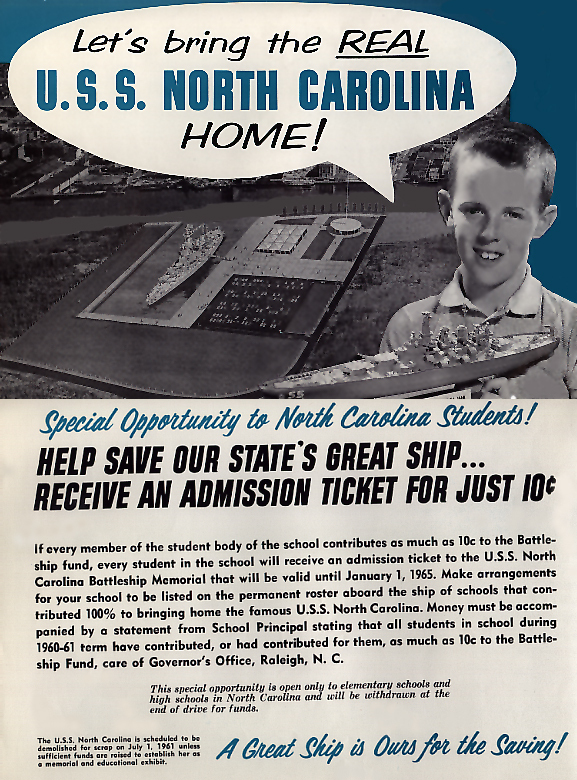 In 1961 students in schools across the state donated their nickels and dimes to have the USS North Carolina moved from dry dock and probable destruction to Wilmington, N.C., to be a museum. The campaign was a success and on October 2 it was moored in its current location across the river from downtown Wilmington. Watch the workshop's bulletin board for the whole story.